It is easy in the world of superheroes to expect huge epic stories where the entire universe is in the balance. But let us be honest, even a superhero has to lay his bow somewhere. So really Hawkeye: Little Hits might be renamed Hawkeye: Little Stories as this S.H.I.E.L.D. agent and Avenger watches the story play out in his living room! Clint Barton has problems. First, he has to help his neighbor Grills with his cranky father during Hurricane Sandy. Then a mystery woman with whom he had a past romantic relationship shows back up, right in front of the three women of his life. And she asks Clint to help her with a heist that could put him back into the crosshairs of the Track-Suits. This along with the Track-Suits threatening everyone in Barton's building and the worst Valentine's Day ever show that it is not always easy be a hero. I really like Hawkeye: Little Hits. Matt Fraction's writing is refreshing and interesting with its focus on character instead of just fights. And the art led by David A is interesting, artistic and unique. The two together combine to make entertainment gold. It is nice to see a book be rewarded for being original and not just supplying endless brawls (though I do enjoy that also for much different reasons). Seriously, there is an entire issue in this collection seen from the perspective of Lucky, Hawkeye's dog! Hawkeye as a title just feels unique to me in a sea of sameness. Hawkeye has four women in his life. First, there is Natasha the Work Wife. Second, the Ex Wife Mockingbird is still in his life. Third, we have his protegé Kate, the other Hawkeye. And finally there is the Friend-Girl, Spider-Woman. Needless to say with all of these women frowning throughout the book, Barton is making a mess of his relationships. And honestly as the volume ends I am not sure how he stands with any of them. I enjoyed the look into each one of these relationships including their stress points. 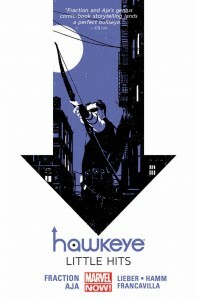 Hawkeye: Little Hits is a big hit with this agent! Fraction shows us that choices, including bad choices by good guys have consequences. And sometimes the innocent victim laying dead on the roof is somebody, because everybody is somebody. I just read this volume about a week ago, so I was glad to see your review this morning. I’m still liking this title, but I felt like Volume 1 was stronger. I’m loving the artwork in these comics! Very original. The Clint and Kate combo continues to be a great comedic duo, and inserting Clint’s other female relationships into the story added another layer of understanding when it comes to Clint’s self-destructive nature.